Culinary Types: Who Needs To Knead? I know I’m late to this party. I mean, everyone and their brother has gotten on the “Artisan Bread in Five Minutes a Day” bread wagon. The book, by Jeff Hertzberg and Zoe Francois was published in 2007, after all. What can I say? I’ve been busy. “Too busy to bake,” as a colleague of mine would say. “Five minutes?” I said. “Surely I can find five minutes this weekend to make bread.” I can now report that I actually spent more time on the checkout line at Target today than it took to prepare this bread dough. Now granted, the math is a little “fuzzy,” as George Bush II used to say. The five minutes is the amount of time it takes to prepare the dough, and shape the loaf. The baking takes about 30 minutes (just slightly less time than I spent on the checkout line at Target today). But, let’s not split hairs. Considering the fact that I’ve never been able to convince bread to rise in my kitchen, “Five Minute a Day” Bread is quite an innovation. There’s no kneading at all. Just mix the flour, water, salt and yeast, and let rest. Since I usually skip the introduction of most books, I’m not positive as to why this works. It has something to do with the ratio of flour, yeast, water and resting time. 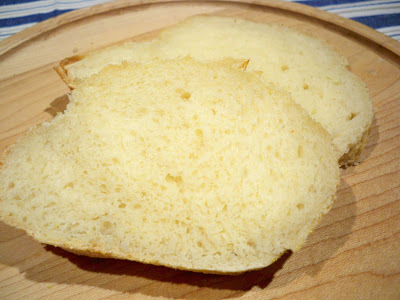 It’s high-moisture bread, and that seems to be the innovation. 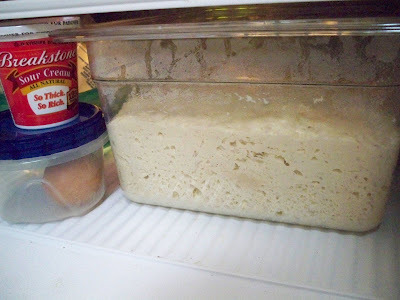 The dough mixture rests in a covered container for two hours or more, and then you can pop it in the refrigerator and just use what you need. 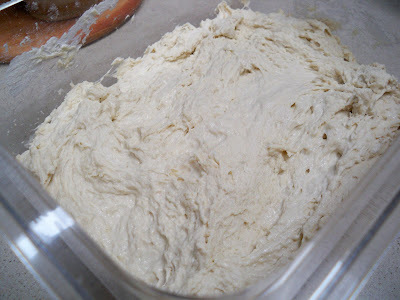 The dough lasts for up to two weeks in the refrigerator. The dough is similar to a sourdough – it builds flavor and character as it ages. As dinner time approaches, the dough has risen nicely. I cut off two handfuls and shape them into round loaves. 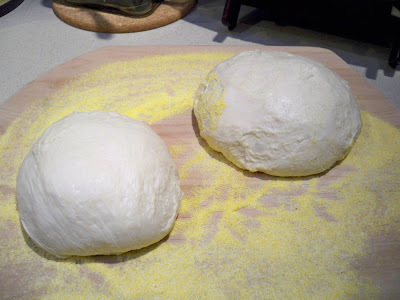 Then, I make a few slashes across the loaves with a sharp knife, pop them into the oven atop a hot pizza stone and within 30 minutes, I have two crusty, golden, piping hot loaves of artisan bread – my daily bread for the week ahead. I think the “scallop” slash results in the most attractive loaf. I’ll admit, I probably screwed up the “tic-tac-toe” pattern slash, but the clock was ticking and I was feeling pressured. 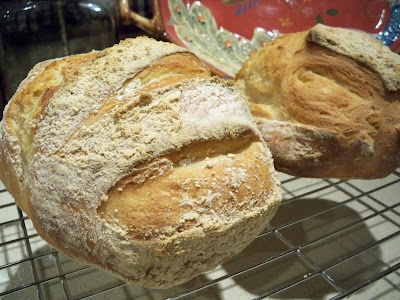 The loaves literally “crackle” as they come out of the oven. The taste is fresh and yeasty, the crust is chewy and crisp, and the texture of the crumb is beautifully uniform. This proves I can work 9 to 5, bring home the bacon, and bake the bread, too. I've been dubious about this bread, though I haven't read the introduction or tried it. I'm glad this was successful for you! This bread recipe sounds like one even I can bake. Is that possible T.W. It looks gorgeous..can bread look gorgeous I wonder? Do I have to touch the flour? You know how I feel about flour. I guess I missed the Artisan Bread Wagon. I hope it isn't too late to jump on...I may have to check out that book. Thanks for posting all the photos of the process. I have read about it quite a few times but hadn't seen any photos. It looks delicious. I should give it a try too. I've been recommending this book to my readers for months, because it really does change your outlook about artisan bread. For someone like me who lives in the middle of nowhere, it means that great bread is attainable without a 20-mile drive to the nearest artisan bakery. And the notion that the dough will wait for you, and that you can make small or large loaves as you need them, is inspired. Welcome to the fold! Ah...my kind of bread. this looks phenomenal, T.W. great job! Your loaves look gorgeous! Thank you for trying the book and I'm so glad you are enjoying all the bread you bake! I love this book! Though I have problems with it under baking I love the texture and flavor. I can't wait to try the other flavors and recipes! Well you may be a bit later than some in trying the bread, but what a gorgeous looking loaf of bread in the photo! I experimented with this bread once, and it's on my list to try again for a 100% whole wheat version. Julia - It really works, and I'm surprised that a day later, it still tastes wonderful. Rochelle - this is the closest to a full day of bread baking without the investment of time. Lydia - I was also impressed with the pizza stone - crisp bread in my electric oven? Who would have thought? Veron - you were a pioneer! Zoe - thanks so much for visiting! I am honored to get a compliment from the author of the book! HBiC - Thanks for dropping by! Having had such good luck with the master recipe, I'm anxious to try an herb bread. Chez Aurora - I'm looking forward to the taste comparison of the bread I make from the initial batch next weekend. Susan - trust me - you don't need to knead! Kalyn - I'm with you - my dream is mastering 100 percent whole wheat! Wow! This looks so delicious!! I really need to invest in this book. I love how crusty the bread gets on the outside and how amazingly moist and chewy it looks on the inside. Great job! I can't live without this bread. It's quick and so good. Great results all the time. Even in pizza. Well, you're many steps ahead of me. This book has been on my wish list with Amazon for months-- along with a much needed restful vacation. You have inspired me to just buy the book and make it happen. 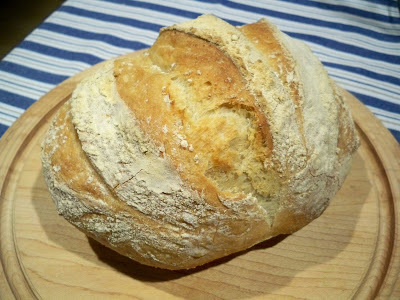 I love home baked bread, and you've done a beautiful job with this one. This is a inspiration to me. It turned out really well~I usually frown when it comes to making bread-takes so long, but I think this is worth the 5 minute effort-and just a few more! I do love homemade breads! This could be most beautiful bread specimen i've ever laid my eyes on. This is absolutely being made at my home this weekend!